For June I went to Big Bear California! It was really fun. It was just my mom, my dad, and me. The first day we were there we just hung out at the pool for a couple hours, it was cold but it was easy to get used to. After that we went to the village in Big Bear and shopped for a long time. I got this necklace type thing that goes around your neck and you can put your keys on it. It is really handy. I use it all the time. When we got back to the room we put in the movie, Aquamarine. I read the book before and the book is always better than the movie but I really like the movie a lot, maybe as much as the book. After the movie I went back to my side of the room and fell asleep. Our room was a suite so I got my own room and my parents got their own room. The next day we rented a pontoon boat and went boating. We went cruising around the lake. After cruising I jumped in the lake and started swimming. It was fun until I got a cut, but it wasn’t that bad. Luckily I didn’t get sunburned, but I did get a nice tan. My mom got the sunburn. The next day all we did was relax and remembered all the good times we had because it was our last full day. But I did have a great time and I would always love to go back. 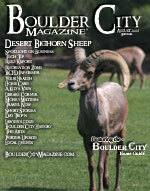 Tell me how you celebrate your summer at info@bouldercity magazine.com. You can also visit my web site at www.elliebug.com.